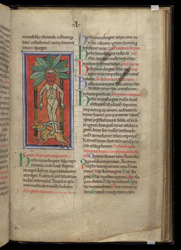 This manuscript lists herbs and other plants, animals, and birds, and their medicinal uses. Each is illustrated, but the representations were apparently copied from other manuscripts, rather than from life (it would usually be very difficult to identify the subjects of the miniatures without the aid of the text). This manuscript is related to several others, which seem to have been made in the north of England, perhaps Durham. Mandrake was used as an anaesthetic during the Middle Ages. It has a root that looks like a human torso with two legs, and this led to the belief that the plant shrieked when it was uprooted, and that anyone who heard it would die or go insane. In order to collect the plant safely, therefore, it would be loosened in the earth, and then tied with a rope to a dog: the dog would then pull it from the ground while humans had their ears safely covered.